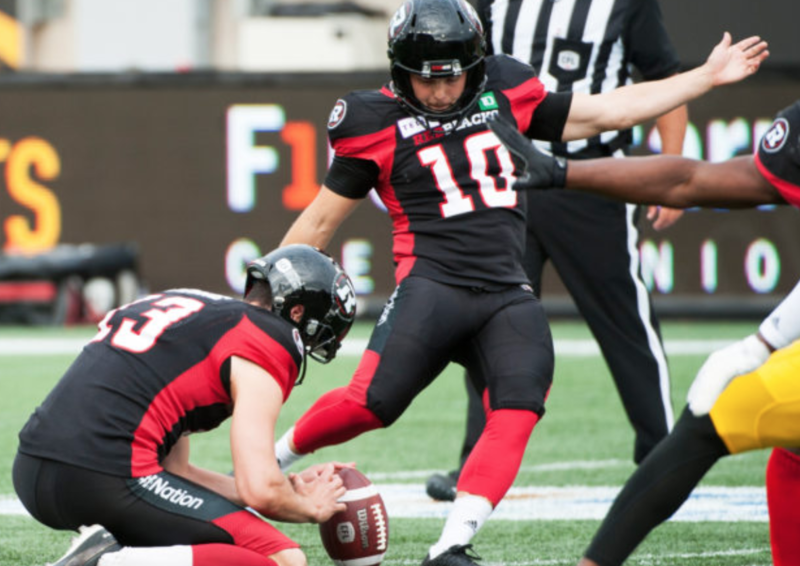 OTTAWA — Ottawa REDBLACKS kicker Lewis Ward set a single-season mark for consecutive field goals on Saturday as he helped his team defeat the Edmonton Eskimos 28-15 at TD Place Stadium. Each one of his kicks came in handy for Ottawa, who held an 18-15 lead late in the fourth quarter completely powered by Ward’s foot. The REDBLACKS would add an insurance touchdown late in the game to finish off the Eskimos. Ward, a Kingston, Ont. native, played his U-Sports football nearby at the University of Ottawa. He helped give the REDBLACKS some breathing room at the top of the Eastern Conference standings as the team improved to 8-5. Ward’s production helped Ottawa stay in front for most of the game and prevented Edmonton from taking enough momentum to swing the tide. REDBLACKS receiver Diontae Spencer, who caught four passes for 89 yards, said Ward’s execution was a key part of Ottawa’s victory. As for Ward, Campbell says he’ll keep riding the hot leg as long as he can, but won’t bring up the streak too often. “I don’t want to jinx him,” he said.